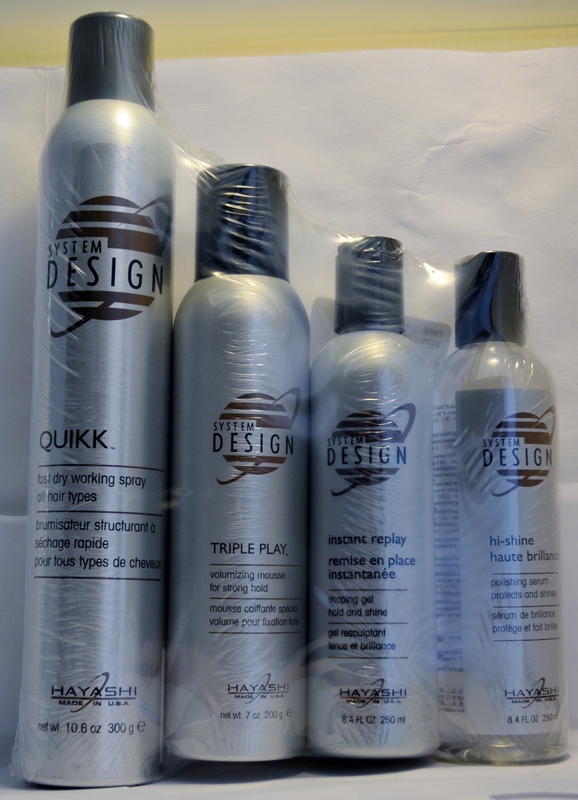 Hayashi System Design Quikk Fast Dry Working Spray All Hair Types: Is an adjustable working and finishing spray. The Flag Ship of the System Design Line. Quikk is a Fast Drying, Working Hairspray. Quikk's clean, fast dry formula adds volume and shine as it protects. Use Quikk Spray to Style or finish. Hayashi System Design Triple Play Volumizing Mousse for Strong Hold: Is a conditioning styling foam. Triple Play is a Strong Hold, Volumizing and Conditioning Mousse. Triple play mousse can be used to blow dry, air dry, style or set. Controls and adds shine. Its rich, conditioning formula is quickly absorbed by all hair types and fulfills every styling need: hair can be set, shaped blown dry, or left to dry naturally. TRIPLE PLAY MOUSSE boosts hair's texture, volume, and shine. No matter how much you use, this 'adjustable' styling foam can be layered on for as much smooth, supple, silky hold as desired. Hayashi System Design Instant Replay Shaping Gel Hold and Shine: Is a firm hold, shine-enhancing styling gel. Instant Replay is a strong hold shaping gel, with amazingly flexible control. Instant Replay is a shaping gel that promotes curl retention, builds body, protects and adds shine. Instant Replay hard-holding, shine-enhancing shaping gel that liquefies on contact for easy distribution. This moisture-encouraging gel is ideal for spot styling, setting, braiding, and blow-drying. It's a very effective tool for taming and smoothing frizzy and hard-to-manage hair. And, INSTANT REPLAY provides 'instant' style memory and endless restyling options when misted with water. Hayashi System Design Hi-Shine Polishing Serum Protects and Shines: Helps protect your hair and give brilliant shine. Hi-Shine Polishing drops silkens dry hair and provides a dazzling shine while it smoothes the cuticle, repairs split ends, and protects against sun damage. Hi-Shine is water soluble and will not weight hair down. This is a 4 pack kit!